With the help of a solitary sea squirt, scientists have resolved the longstanding puzzle of the crystal structure of vaterite, an enigmatic geologic mineral and biomineral. A form of calcium carbonate, vaterite can be found in Portland cement. Its quick transformation into other more stable forms of calcium carbonate when exposed to water helps make the cement hard and water resistant. As a biomineral, vaterite is found in such things as gallstones, fish otoliths, freshwater pearls, and the healed scars of some mollusk shells. But unlike most minerals, vaterite has defied every effort to resolve its crystal structure, stymieing scientists for nearly 100 years. The structure of a mineral crystal is a critically important feature and is determined by how atoms are arranged in the crystal. The arrangement of atoms and the resulting crystal structure, for instance, make the difference between graphite and diamond, both forms of pure carbon. Now, however, a team of scientists from the Technion-Israel Institute of Technology and the University of Wisconsin-Madison has discovered the crystalline secrets of vaterite with the help of a needlelike spicule from a sea squirt found in the Mediterranean and Red Seas. 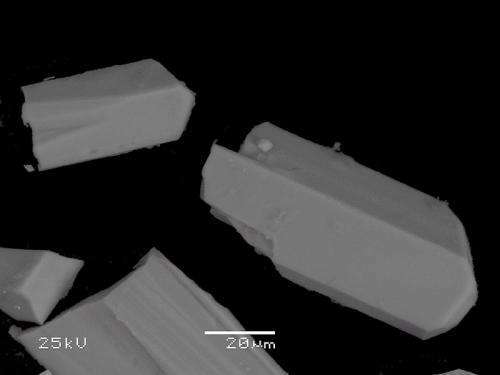 Writing today (April 25, 2013) in the journal Science, a group led by Boaz Pokroy of Technion and Pupa Gilbert of UW-Madison report that vaterite is composed of two different crystal structures that "coexist within a pseudo-single crystal." "We never envisaged this scenario," explains Pokroy, a professor of materials science and engineering at Technion. "It was a total surprise, but at the same time it made so much sense knowing the years of conflicting results from different groups publishing on the structure of vaterite." Ferreting out the structure of the mineral, according to Gilbert, a UW-Madison professor of physics, was challenging because of the difficulty of finding large, pure single crystals of vaterite. Enter Herdmania momus, a solitary sea squirt, and member of a large family of filter-feeding marine invertebrates. "This organism makes the best crystal," avers Gilbert, an expert on crystalline biominerals formed by marine animals. "Geologic vaterite is extremely rare and unstable. The synthetic version is a powder and yields only small crystal grains with poor structure." In nature, sea squirts and sponges use spicules as a skeleton to provide structural support. The spicule from the sea squirt Herdmania momus is composed of a large, single crystal that Pokroy and Gilbert used to unmask the atomic structure of its constituent biomineral vaterite using state-of-the-art high-resolution transmission electron microscopy at Technion. "The Herdmania momus spicules were known to be made of vaterite since 1975 when a paper by the late Heinz Lowenstam of CalTech was published in Science," notes Pokroy. "It was clear that this would be the best source of biogenic vaterite and geologic vaterite we could ever find." The big discovery, say Gilbert and Pokroy, is that vaterite is really two interspersed crystal structures: "It changes the concept of vaterite," Pokroy says, explaining that knowledge of the atomic properties of a crystalline structure enable prediction and explanation of its physical properties. "Now we know that 'vaterite' is not just one structure, but is composed of two different ones." "The second crystal structure in vaterite is less abundant," says Gilbert, "occurring only at the nano scale, and is visible only in certain orientations, and its atomic structure remains unknown." More information: "Vaterite Crystals Contain Two Interspersed Crystal Structures" Science, 2013.